Last year, we conducted our first workshop with teenage girls as part of the JJSS Balika Chatravriti (girls scholarship). This experience motivated us to do more workshops with children. This year, we have conducted three overnight camps with the scholarship recipients at the JJSS training center, our first JJSS women’s workshop, over 30 day camps for kids across several panchayats, and our first village-level workshop for teenage girls in Chatar panchayat. Above and beyond these numbers, a space has been established within JJSS for buniyadi nirmaan. Some of these experiences were shared on our blog: Naav meri chali and Cinema waala. 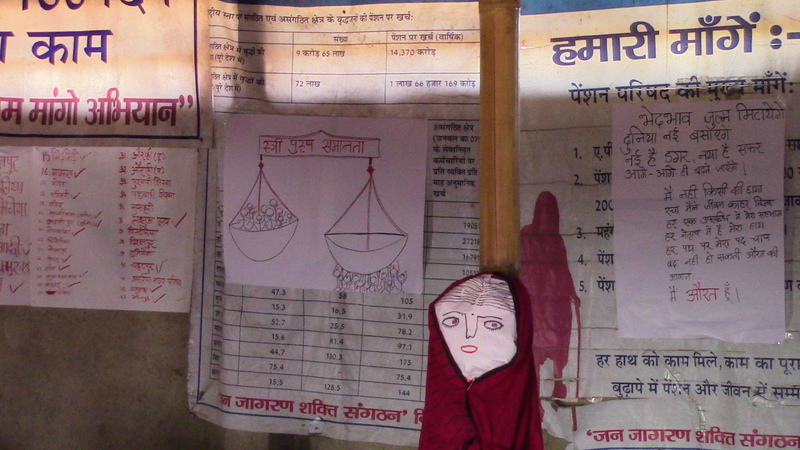 Workshops on gender equity, nutrition, and health have become as important to our saathis as the struggle for NREGA or PDS. 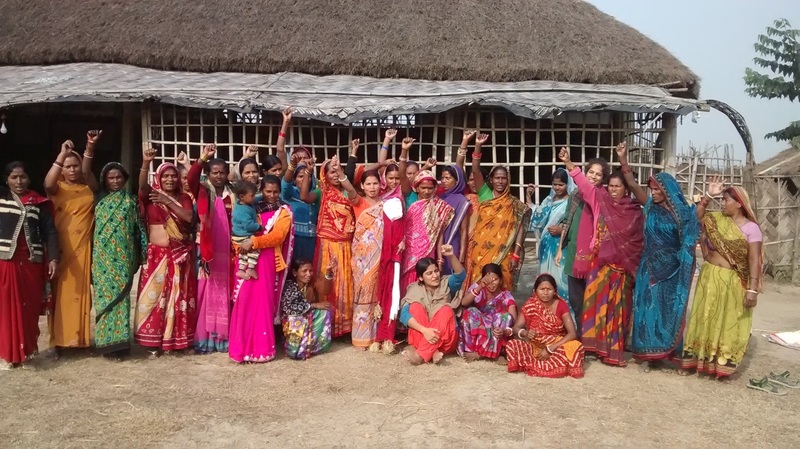 This has also enabled collaborations with volunteers like Apoorva, Kanika, and Tanaya who travelled for over 24 hour to Araria to facilitate these workshops. We are excited by the possibilities that await us in 2015. 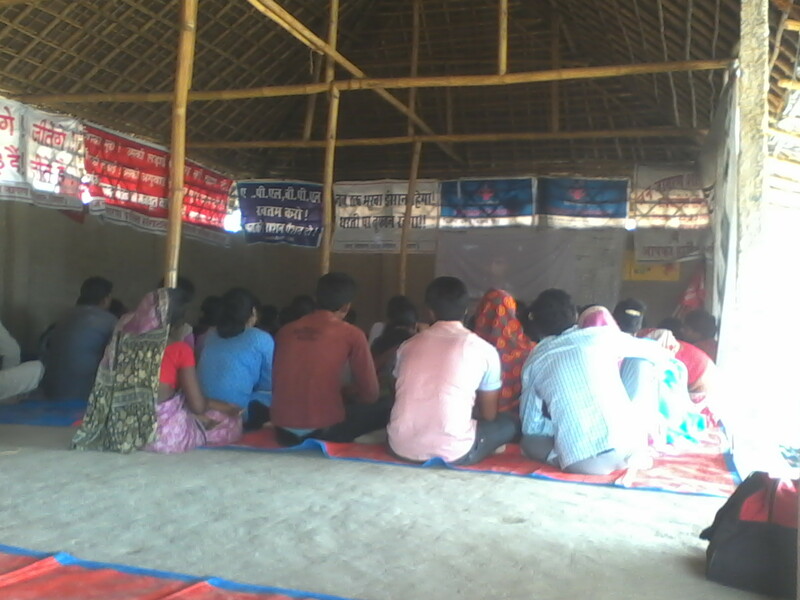 After running the JJSS children’s club and organizing workshops in Araria, the JJSS youth team felt ready to hold similar events in the villages. Also, we had Rudra, a volunteer with natural ability to engage with kids. The first camp happened on May 5th right outside Deepnarayan ji’s house in Amgachhi panchayat. We made the outside mud wall of his house our projection screen, and the open space near it our sitting area. Rudra held a fascinating introduction round where everyone had to mimic eating their favorite food item. After some hesitation, everyone joined-in the fun. Then, nearly 60 kids drew and painted their favorite pictures. A lot of flowers as usual, but some more interesting ones like a school and a colorful girl. This was followed by distribution of story books (Thanks to Pratham Katihar). Finally, we all watched Meena videos, and Chak De movie. Low sound and all, everyone stuck around until the end! This year saw a lot of activity in the scholarship program. We had three workshops – each a two day event with multiple sessions, launch of the second round of scholarship with a new cohort of 24 recipients, and lot of discussion around underage marriage. While gender and equity have been the continuing threads that have woven through all these camps, we also had sessions on importance of making rules, constitution, women don’t talk politics, religion and politics, underage marriage, sangharsh (struggle), and health. We also watched several films together like Well Done Abba, Mulan, Gandhi, Satyamev Jayate episodes, and our all-time favorite Meena series. Feb 8th and 9th: our first overnight camp started with a session on the importance of making rules, after which the participants made rules for their camp on punctuality and cleanliness. This was followed by an introduction to the preamble of Indian constitution, and then a longer discussion on gender equality including screening of Meena – aam ka batwara,and the episode on female foeticide. After dinner, we watched Well done abba, which was mentioned as the highlight of the camp by many during the feedback session next morning. “My parents say that they love my brother and me equally. But then why am I the only one who keeps getting interrupted to do household chores?” This question, rather a sudden outburst, from a seventeen year old girl took us by surprise at the closing moments of the workshop. Until then, very few words had been publicly spoken by the participants despite our repeated attempts. We were delighted at having such an emotional response, but careful in handling it – for outspoken girls are quickly labelled as having a bad character. So, we discussed on how to present our viewpoints in a polite and tactful way. It felt like a perfect closing moment to the workshop. May 17th and 18th: our third camp started a day after the results of general elections were declared. Hence we had multiple sessions on politics including girls don’t talk politics, religion and politics, followed by screening of Ram ke Naam. This led to an interesting discussion when one of our youth team members asked why it was wrong to retaliate if a temple had been previously demolished to build the mosque. This kind of one-sided thinking is what we hope to address through these camps. 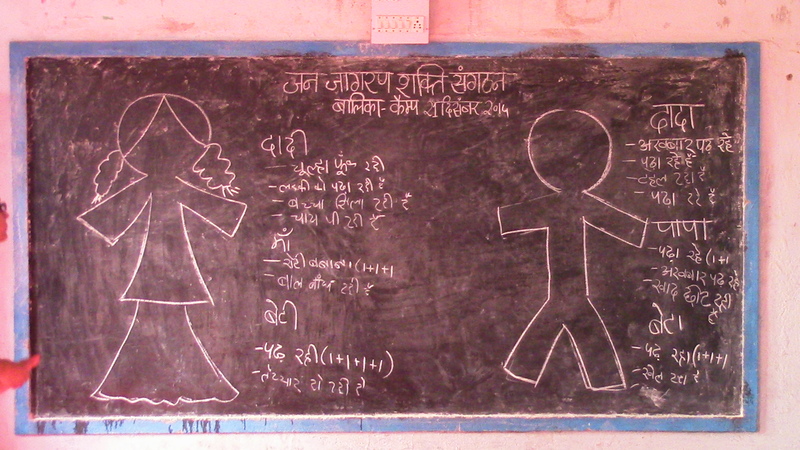 After an hour of creative expression, we started the session on underage marriage. When we started the scholarship program, somehow this issue skipped our minds. Maybe it is a reflection of how little we interacted with teenage girls in our villages. But it became clear from the first workshop in June 2013 that underage marriage would be a dominant issue. 20% of the girls were already married, one even had a kid. By the February 2014 workshop, the number of married girls had increased to over 30%. One of them even had a miscarriage. At 16 years old, we were not even sure if she realized what that meant. Her half smile was a painful reminder of what was at stake – not just the girl’s life, but the next generation as well. These observations led to a lot of discussion on what should be JJSS’ stand on underage marriage. We wanted to continue our interactions with these girls, but still send a signal to their parents that JJSS was unequivocally against child marriage. So we decided that only unmarried girls below the age of 18 years would be eligible for the scholarship. Remaining would be invited to specialized workshops for married girls with reimbursement for travel costs. 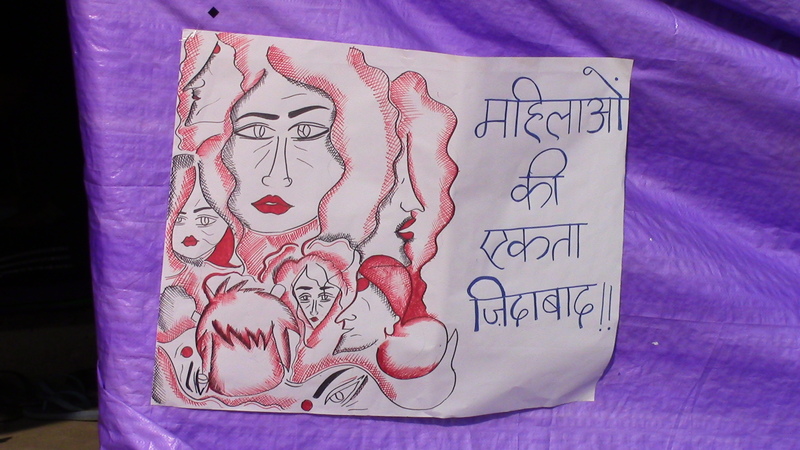 All the girls whole-heartedly supported JJSS’ stand, and even read out a pledge against underage marriage. But as we watched Mulan break gender stereotypes under the starlit skies, many questions still remained on this sensitive but critical issue. Dec 13th and 14th: this was the fourth and final camp for our first batch of scholarship recipients. Our goal was to reestablish the previous themes of gender and equity, and introduce the idea of sangharsh, both collective and individual. We also invited the second cohort so that they could interact with the first group (In hindsight, mixing the groups wasn’t the best idea). Having two new volunteers, Kanika and Tanaya, helped us to dream big. Tanaya led a session on enthusiasm building, as part of which the girls were divided into groups of six and asked to enact a still scene from their household. Most of them assigned typical gendered roles to their female family members, which stood in stark contrast with their dreams of becoming a teacher or a police offer. This activity became the basis for further discussions on gender and equity. In the next session, participants were again divided into groups and each given one photo visual from December 2nd Abki Baar Humara Adhikar rally, protests against Forbesganj police firing, Irom Sharmila against AFSPA, or Jal Satyagrahis of Narmada Bachao Andolan. They discussed these larger collective struggles within the group and prepared posters to present it to the whole gathering. The idea of sangharsh was further established in the next session through the musical couple Rimjhim and Mithu. Their rendition of khali polythene se yeh sapne and gaon chodab nahin had everyone singing along and discussing their right to land and water. Finally, we closed the night by watching Gandhi and the story of Indian independence struggle. Next morning, Kanika, who is also the NAPM national organizer, led our first-ever session on health. It was so well received by the girls that it prompted us to do couple more sessions with other groups. 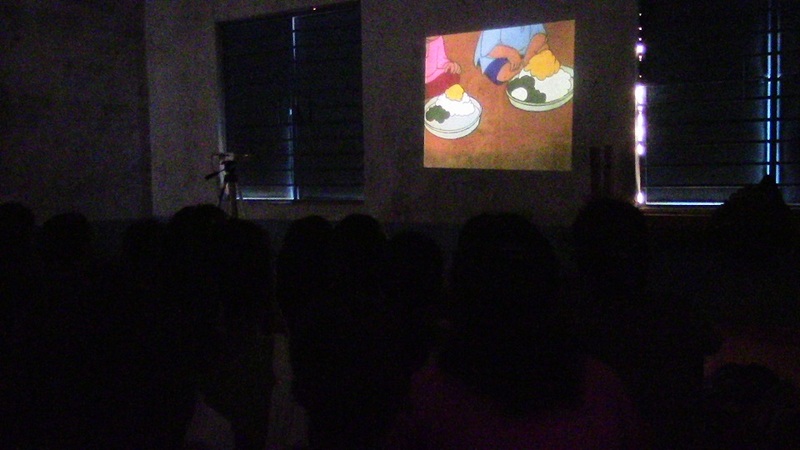 Our next session continued the sangharsh theme by screening the story of the girls from Bhim high school in Rajasthan. Seeing this fight for right to education, our participants also discussed what reforms they wanted in their schools. Not surprisingly, toilets, safety, and teacher attendance and ratio topped their lists. The last session had them sharing their individual struggles, and many interesting stories came out: from getting their sports teacher to give them playing time, to saying no to early marriage, these stories resonated with one and all. The camp ended with discussions on future plans, especially for the first cohort. All of them expressed interest in joining future camps and even conducting workshops in their villages. 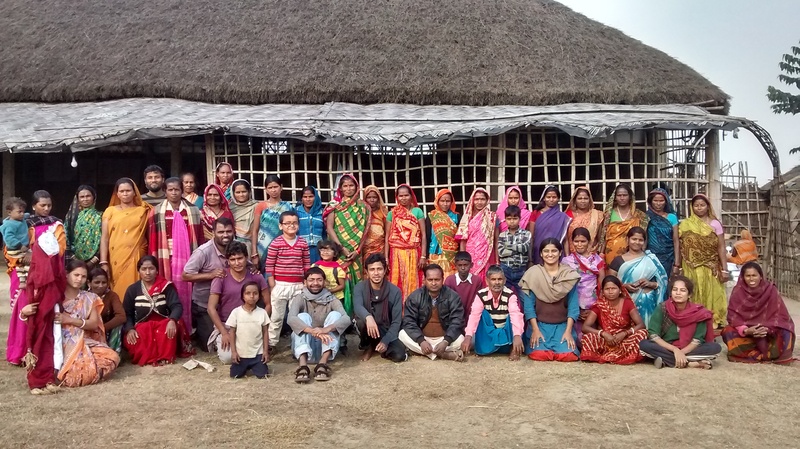 We also grabbed this opportunity and conducted our first village-level workshop a week later. Buoyed by Kanika’s energy and the positive experience of the scholarship camp, we organized our first-ever women’s workshop for 30 female saathis of JJSS on Dec 19th and 20th. The day started with a floating balloon game where the participants were divided into groups and each group was asked to keep their balloon (labeled as NREGA, Pension, PDS, and Health) afloat only by blowing their breath at it. The excitement this game generated even caught us by surprise. Each group, already familiar with the process of collective struggle, figured out ways to keep their balloon afloat the longest. 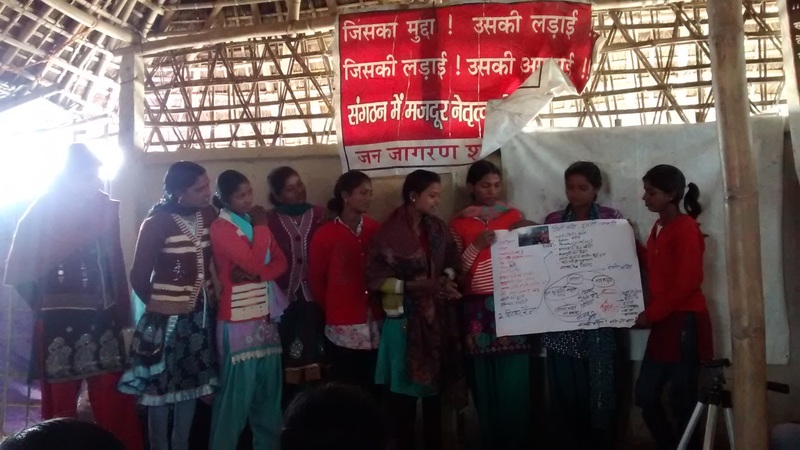 Dec 21st: we conducted our first village-level workshop for teenage girls in Chatar panchayat. But the actual credit of organizing the camp goes to Rani, Karishma, Gudia, and Pooja – the four scholarship recipients who voluntarily took the responsibility of inviting 30 participants, selected the meeting place, and even arranged for tea and food. In addition to handling the logistics, they were also vocal leaders during the workshop. They made us realize the power of having such workshops in the natural environment of the participants. The workshop started with the participants telling their name and favorite food, followed by the floating balloon game. Even though all the groups participated energetically, their first attempt lacked teamwork. After we shared our observations, the second round was much more cohesive. Visibly energized after the game, we started the second activity of enacting a still scene from their household. Once again, common stereotypes of roles and responsibilities within the household emerged. This led nicely into a discussion on male and female characteristics. While they quickly changed their positions on most traits being gender independent, certain reservations remained about cooking and what constituted more challenging work. So we watched Meena – aam ka batwara, which also became a good entry point into health and nutrition. The final session started by watching the Bhim school struggle video, followed by feedback on the workshop. The icebreaker activities were really liked by the girls and so was the session on their health. This feedback just reinforced the importance of having more such village-levels workshops.